Antinous is an obsolete constellation no longer in use by astronomers, having been merged into Aquila, which it bordered to the North. The constellation was created by the emperor Hadrian in 132. According to legend, Hadrian was told by an oracle that only the death of his most beloved person would save him from a great danger. Sure enough, Antinous, a beautiful youth loved by Hadrian, died while saving the Emperor from drowning in the Nile, for his memory Hadrian identified an asterism in the sky with Antinous. Seen in Urania's Mirror (1825). 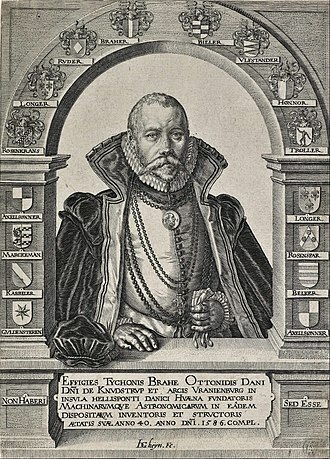 Tycho Brahe was originally given credit for inventing Antinous, but current finds include a celestial globe by the cartographer Caspar Vopel from 1536 that contains Antinous, so Brahe simply measured up the sky according to contemporary traditions and decided to give Antinous a separate table in his star catalogue. In the following modern times, Antinous has been variously considered an asterism within Aquila or as a separate constellation, until the International Astronomical Union discarded it when formalizing the constellations in 1930. ^ An Outline Sketch of the Origin and History of Constellations and Star-Names Archived November 7, 2010, at the Wayback Machine. by Gary D. Thompson, search for "Antinous"
^ Tycho B., (ed.) "Stellarum Inerrantium Plurimarum et Praecipuarum...", Astronomiae Instauratae Progymnasmata, Uraniburgi Daniae, 1602, p. 269 l.
Wikimedia Commons has media related to Antinous (constellation). Aries is one of the constellations of the zodiac. It is located in the celestial hemisphere between Pisces to the west and Taurus to the east. The name Aries is Latin for ram, and its symbol is and it is one of the 48 constellations described by the 2nd century astronomer Ptolemy, and remains one of the 88 modern constellations. It is a constellation, ranking 39th overall size, with an area of 441 square degrees. Although Aries came to represent specifically the ram whose fleece became the Golden Fleece of Ancient Greek mythology, before that, the stars of Aries formed a farmhand. Different cultures have incorporated the stars of Aries into different constellations including twin inspectors in China, Aries is a relatively dim constellation, possessing only four bright stars, Sheratan, and 41 Arietis. The few deep-sky objects within the constellation are faint and include several pairs of interacting galaxies. Several meteor showers appear to radiate from Aries, including the Daytime Arietids, Aries is now recognized as an official constellation, albeit as a specific region of the sky, by the International Astronomical Union. It was originally defined in ancient texts as a pattern of stars. In the description of the Babylonian zodiac given in the clay tablets known as the MUL. APIN, the MUL. APIN was a comprehensive table of the risings and settings of stars, which likely served as an agricultural calendar. Modern-day Aries was known as MULLÚ. ḪUN. GÁ, The Agrarian Worker or The Hired Man, the earliest identifiable reference to Aries as a distinct constellation comes from the boundary stones that date from 1350 to 1000 BC. 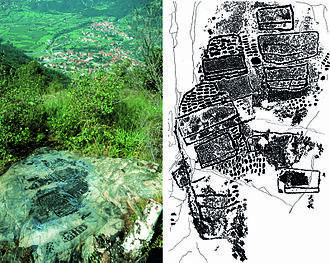 On several boundary stones, a zodiacal ram figure is distinct from the characters present. The shift in identification from the constellation as the Agrarian Worker to the Ram likely occurred in Babylonian tradition because of its association with Dumuzi the Shepherd. By the time the MUL. APIN was created—by 1000 BC—modern Aries was identified with both Dumuzis ram and a hired laborer, the exact timing of this shift is difficult to determine due to the lack of images of Aries or other ram figures. Eridanus is a constellation in the southern hemisphere. 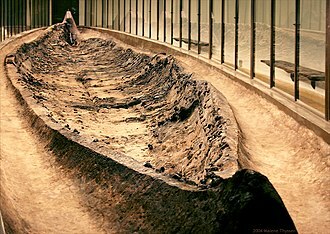 It is represented as a river and it was one of the 48 constellations listed by the 2nd century astronomer Ptolemy, and it remains one of the 88 modern constellations. It is the sixth largest of the modern constellations, the same name was taken as a Latin name for the real Po River and for the name of a minor river in Athens. At its southern end is the magnitude 0.5 star Achernar,144 light-years from Earth, it is a blue-white hued main sequence star whose traditional name means the rivers end. Achernar is a very peculiar star because it is one of the flattest stars known, observations indicate that its radius is about 50% larger at the equator than at the poles. This distortion occurs because the star is spinning extremely rapidly, there are several other noteworthy stars in Eridanus, including some double stars. 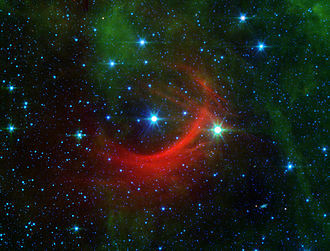 Beta Eridani, traditionally called Cursa, is a star of magnitude 2.8,89 light-years from Earth. Its place to the south of Orions foot gives it its name, theta Eridani, called Acamar, is a binary star with blue-white components, distinguishable in small amateur telescopes and 161 light-years from Earth. Draco is a constellation in the far northern sky. Its name is Latin for dragon and it was one of the 48 constellations listed by the 2nd century astronomer Ptolemy, and remains one of the 88 modern constellations today. The north pole of the ecliptic is in Draco, Draco is circumpolar, and can be seen all year from northern latitudes. Thuban was the pole star from 3942 BC, when it moved farther north than Theta Boötis. The Egyptian Pyramids were designed to have one side facing north, with an entrance passage geometrically aligned so that Thuban would be visible at night, due to the effects of precession, it will again be the pole star around the year AD21000. It is a giant star of magnitude 3.7,309 light-years from Earth. The traditional name of Alpha Draconis, means head of the serpent, there are two other stars under magnitude 3 in Draco. The brighter of the two, and the brightest star in Draco, is Gamma Draconis, traditionally called Etamin or Eltanin and it is an orange giant star of magnitude 2.2,148 light-years from Earth. The aberration of starlight was discovered in 1728 when James Bradley observed Gamma Draconis, beta Draconis, traditionally called Rastaban, is a yellow giant star of magnitude 2.8,362 light-years from Earth. Its name shares a meaning with Thuban, head of the serpent, Draco is home to several double stars and binary stars. η Draconis is a star with a yellow-hued primary of magnitude 2.8. The two are separated by 4.8 arcseconds, mu Draconis, traditionally called Alrakis, is a binary star with two white components. Magnitude 5.6 and 5.7, the two orbit each other every 670 years. The Alrakis system is 88 light-years from Earth, nu Draconis is a similar binary star with two white components,100 light-years from Earth. Both components are of magnitude 4.9 and can be distinguished in an amateur telescope or a pair of binoculars. Omicron Draconis is a double star divisible in small telescopes, the primary is an orange giant of magnitude 4.6,322 light-years from Earth. The secondary is of magnitude 7.8, psi Draconis is a binary star divisible in binoculars and small amateur telescopes,72 light-years from Earth. Canes Venatici /ˈkeɪniːz vᵻˈnætᵻsaɪ/ is one of the 88 official modern constellations. It is a northern constellation that was created by Johannes Hevelius in the 17th century. Its name is Latin for hunting dogs, and the constellation is depicted in illustrations as representing the dogs of Boötes the Herdsman. The stars of Canes Venatici are not bright, in classical times, they were listed by Ptolemy as unfigured stars below the constellation Ursa Major in his star catalogue. In medieval times, the identification of these stars with the dogs of Boötes arose through a mistranslation, some of Boötess stars were traditionally described as representing the club of Boötes. When the Arabic text was translated into Latin, the translator Gerard of Cremona mistook the Arabic word كلاب for kilāb, meaning dogs. In 1533, the German astronomer Peter Apian depicted Boötes as having two dogs with him and these spurious dogs floated about the astronomical literature until Hevelius decided to specify their presence in the sky by making them a separate constellation in 1687. Hevelius chose the name Asterion for the dog and Chara for the southern dog, as Canes Venatici. In his star catalogue, the Czech astronomer Bečvář assigned the names Asterion to β CVn, Canes Venatici is bordered by Ursa Major to the north and west, Coma Berenices to the south, and Boötes to the east. The three-letter abbreviation for the constellation, as adopted by the International Astronomical Union in 1922, is CVn, the official constellation boundaries, as set by Eugène Delporte in 1930, are defined by a polygon of 14 sides. In the equatorial coordinate system, the right ascension coordinates of these borders lie between 12h 06. 2m and 14h 07. 3m, while the coordinates are between +27. 84° and +52. 36°. Covering 465 square degrees, it ranks 38th of the 88 constellations in size, Canes Venatici contains no bright stars, α and β CVn being only of 3rd and 4th magnitude respectively. Flamsteed catalogued 25 stars in the constellation, labelling them 1 to 25 Canum Venaticorum, α CVn is the constellations brightest star, named by Sir Charles Scarborough in memory of King Charles I, the deposed king of Britain. Aquila is a constellation on the celestial equator. Its name is Latin for eagle and it represents the bird who carried Zeus/Jupiters thunderbolts in Greco-Roman mythology and its brightest star, Altair, is one vertex of the Summer Triangle asterism. The constellation is best seen in the summer as it is located along the Milky Way. Because of this location along the line of our Galaxy, many clusters and nebulae are found within its borders, Aquila was one of the 48 constellations described by the 2nd century astronomer Ptolemy. It had been mentioned by Eudoxus in the 4th century BC. It is now one of the 88 constellations defined by the International Astronomical Union, the constellation was known as Vultur volans to the Romans, not to be confused with Vultur cadens which was their name for Lyra. It is often held to represent the eagle who held Zeuss/Jupiters thunderbolts in Greco-Roman mythology, Aquila is associated with the eagle who kidnapped Ganymede, a son of one of the kings of Troy, to Mount Olympus to serve as cup-bearer to the gods. Hevelius determined twenty-three stars in the first and nineteen in the second, the Greek Aquila is probably based on the Babylonian constellation of the Eagle, which is located in the same area as the Greek constellation. Aquila, which lies in the Milky Way, contains many rich starfields and has been the location of many novae, α Aql is the brightest star in this constellation and one of the closest naked-eye stars to Earth at a distance of 17 light-years. Its name comes from the Arabic phrase al-nasr al-tair, meaning the flying eagle, Altair has a magnitude of 0.76. β Aql is a star of magnitude 3.7,45 light-years from Earth. Its name comes from the Arabic phrase shahin-i tarazu, meaning the balance, this referred to Altair, Alshain. γ Aql is a giant star of magnitude 2.7,460 light-years from Earth. Its name, like that of Alshain, comes from the Arabic for the balance, ζ Aql is a blue-white-hued star of magnitude 3.0,83 light-years from Earth. η Aql is a supergiant star,1200 light-years from Earth. Cassiopeia is a constellation in the northern sky, named after the vain queen Cassiopeia in Greek mythology, who boasted about her unrivalled beauty. Cassiopeia was one of the 48 constellations listed by the 2nd-century Greek astronomer Ptolemy and it is easily recognizable due to its distinctive W shape, formed by five bright stars. It is opposite the Big Dipper, in northern locations above 34ºN latitude it is visible year-round and in the tropics it can be seen at its clearest from September to early November. Even in low southern latitudes below 25ºS it can be low in the North. At magnitude 2.2, Alpha Cassiopeiae, or Schedar, is generally the brightest star in Cassiopeia, though is often shaded by Gamma Cassiopeiae, which has brightened to magnitude 1.6 on occasion. The constellation hosts some of the most luminous stars known, including the yellow hypergiants Rho Cassiopeiae and V509 Cassiopeiae, the semiregular variable PZ Cassiopeiae is one of the largest known stars. In 1572, Tycho Brahes supernova flared brightly in Cassiopeia, fourteen star systems have been found to have exoplanets, one of which—HR 8832—is thought to host seven planets. The constellation is named after Cassiopeia, the queen of Aethiopia, Cassiopeia was the wife of King Cepheus of Aethiopia and mother of Princess Andromeda. Cepheus and Cassiopeia were placed next to each other among the stars, Andromeda was rescued by the hero Perseus, whom she married. Cassiopeia has been variously portrayed throughout her history as a constellation, in Persia, she was drawn by al-Sufi as a queen holding a staff with a crescent moon in her right hand, wearing a crown, as well as a two-humped camel. 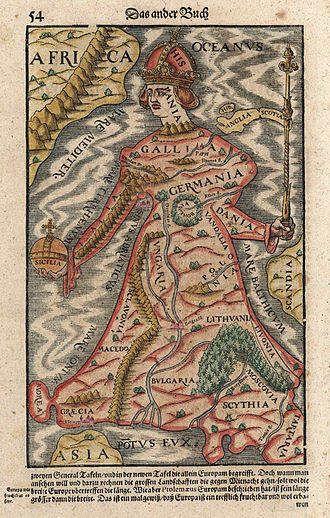 In France, she was portrayed as having a marble throne and this depiction is from Augustin Royers 1679 atlas. In the ancient Celtic world Anu was the goddess and considered to be the mother of all the gods. Other references say that she is the earth goddess or the Goddess of fertility. Anu was known, in the Celtic World, by similar names. She still looks down on us from the sky where she appears as Llys Don. In Chinese astronomy, the forming the constellation Cassiopeia are found among three areas, the Purple Forbidden enclosure, the Black Tortoise of the North, and the White Tiger of the West. Uranias Mirror, or, a view of the Heavens is a set of 32 astronomical star chart cards, first published in November 1824. They had illustrations based on Alexander Jamiesons A Celestial Atlas, and they were engraved by Sidney Hall, and were said to be designed by a lady, but have since been identified as the work of the Reverend Richard Rouse Bloxam, an assistant master at Rugby School. The cover of the box-set showed a depiction of Urania, the muse of astronomy, P. D. Uranias Mirror illustrates 79 constellations, some of which are now obsolete, and various subconstellations, such as Caput Medusæ. Some cards focus on a constellation, others include several, with Card 32, centered on Hydra. Card 28 has six, and no other card has more than four, each card measures 8 inches by 5 1⁄2. A book by Jehoshaphat Aspin entitled A Familiar Treatise on Astronomy was written to accompany the cards. Both the book and cards were published by Samuel Leigh,18 Strand, although the publishing firm had moved to 421 Strand. The cards and books came within a box illustrated with a woman almost certainly intended to be Urania, hingley calls it One of the most charming and visually attractive of the many aids to astronomical self-instruction produced in the early nineteenth century. While he had several sons, he has no other known publications. The reasons for the disguise are unknown, hingley notes that many contemporary publications attempted to suggest women had played a role in their creation, perhaps to make them sound less threatening. Ian Ridpath, noting the plagiarism of the art from A Celestial Atlas, a December 1824 advertisement, which states the cards were just published, offered the cards plain at £1/8s or fully coloured for £1/14s. This first edition did not include any stars surrounding the named constellations and this was changed for the second edition, which added back stars around theose constellations. An American edition was published in 1832, modern reprints were produced in 1993, and Barnes & Noble reproduced the American edition in 2004. Corona Borealis is a small constellation in the Northern Celestial Hemisphere. It is one of the 48 constellations listed by the 2nd-century astronomer Ptolemy and its brightest stars form a semicircular arc. Its Latin name, inspired by its shape, means northern crown, in classical mythology Corona Borealis generally represented the crown given by the god Dionysus to the Cretan princess Ariadne and set by him in the heavens. Other cultures likened the pattern to a circle of elders, an eagles nest, Ptolemy listed a southern counterpart, Corona Australis, with a similar pattern. The brightest star is the magnitude 2.2 Alpha Coronae Borealis, T Coronae Borealis, known as the Blaze Star, is another unusual type of variable star known as a recurrent nova. Normally of magnitude 10, it last flared up to magnitude 2 in 1946, ADS9731 and Sigma Coronae Borealis are multiple star systems with six and five components respectively. Five star systems have found to have Jupiter-sized exoplanets. Abell 2065 is a highly concentrated galaxy cluster one billion light-years from the Solar System containing more than 400 members, covering 179 square degrees and hence 0. 433% of the sky, Corona Borealis ranks 73rd of the 88 modern constellations by area. Its position in the Northern Celestial Hemisphere means that the constellation is visible to observers north of 50°S. It is bordered by Boötes to the north and west, Serpens Caput to the south, the three-letter abbreviation for the constellation, as adopted by the International Astronomical Union in 1922, is CrB. The official constellation boundaries, as set by Eugène Delporte in 1930, are defined by a polygon of eight segments. In the equatorial coordinate system, the right ascension coordinates of these borders lie between 15h 16. 0m and 16h 25. 1m, while the coordinates are between 39. 71° and 25. 54°. It has a counterpart—Corona Australis—in the Southern Celestial Hemisphere, the seven stars that make up the constellations distinctive crown-shaped pattern are all 4th-magnitude stars except for the brightest of them, Alpha Coronae Borealis. The other six stars are Theta, Gamma, Epsilon, the German cartographer Johann Bayer gave twenty stars in Corona Borealis Bayer designations from Alpha to Upsilon in his 1603 star atlas Uranometria. Coma Berenices is an ancient asterism in the northern sky which has been defined as one of the 88 modern constellations. It is located in the fourth quadrant, between Leo and Bootes, and is visible in both hemispheres. It was introduced to Western astronomy during the third century BC by Conon of Samos and its name means Berenices Hair in Latin and refers to Queen Berenice II of Egypt, who sacrificed her long hair as a votive offering. Coma Berenices is the modern constellation named for an historic figure. It was further corroborated as a constellation by Gerardus Mercator and Tycho Brahe, three of the constellations stars are visible to the naked eye, Alpha Comae Berenices, Beta Comae Berenices and Gamma Comae Berenices. They form a 45-degree triangle, from which Berenices imaginary tresses hang, the constellations brightest star is Beta Comae Berenices, a 4. 2-magnitude main sequence star similar to the Sun. Coma Berenices contains the North Galactic Pole and one of the richest known galaxy clusters, Galaxy Malin 1, in the constellation, is the first known giant low-surface-brightness galaxy. Supernova SN 2005ap discovered in Coma Berenices is the brightest known, the star FK Comae Berenices is the prototype of an eponymous class of variable stars. The constellation is the radiant of one meteor shower, Coma Berenicids, Coma Berenices has been recognized as an asterism since the Hellenistic period, and is the only modern constellation named for an historic figure. 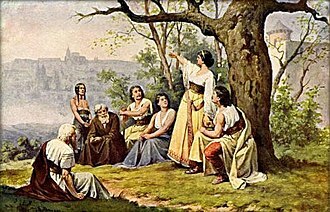 It was introduced to Western astronomy during the third century BC by Conon of Samos, Berenice vowed to sacrifice her long hair as a votive offering if Ptolemy returned safely from battle during the Third Syrian War. In Callimachus poem, Berenice dedicated her tresses to all the gods, in the Latin translation of the poem by the Roman poet Catullus and in Hyginus De astronomica, she dedicated her tresses to Aphrodite and placed them in the temple of Arsinoe II at Zephyrium. According to De astronomica, by the morning the tresses had disappeared. Conon proposed that Aphrodite had placed the tresses in the sky as an acknowledgement of Berenices sacrifice, Callimachus called the asterism plokamos Berenikēs or bostrukhon Berenikēs in Greek, translated into Latin as Coma Berenices by Catullus. Cygnus /ˈsɪɡnəs/ is a northern constellation lying on the plane of the Milky Way, deriving its name from the Latinized Greek word for swan. The swan is one of the most recognizable constellations of the summer and autumn. Cygnus was among the 48 constellations listed by the 2nd century astronomer Ptolemy, Cygnus contains Deneb, one of the brightest stars in the night sky and one corner of the Summer Triangle, as well as some notable X-ray sources and the giant stellar association of Cygnus OB2. One of the stars of this association, NML Cygni, is one of the largest stars currently known. The constellation is home to Cygnus X-1, a distant X-ray binary containing a supergiant. Many star systems in Cygnus have known planets as a result of the Kepler Mission observing one patch of the sky, in Greek mythology, Cygnus has been identified with several different legendary swans. The Greeks associated this constellation with the story of Phaethon, the son of Helios the sun god. 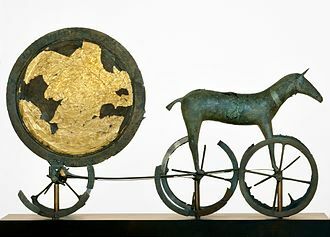 Phaethon, was unable to control the reins, forcing Zeus to destroy the chariot with a thunderbolt, according to the myth, Phaethons brother, grieved bitterly and spent many days diving into the river to collect Phaethons bones to give him a proper burial. The gods were so touched by Cycnuss devotion to his brother that they turned him into a swan, in Ovids Metamorphoses, there are three people named Cygnus, all of whom are transformed into swans. Alongside Cycnus, noted above, he mentions a boy from Tempe who commits suicide when Phyllius refuses to him a tamed bull that he demands. He mentions a son of Neptune who is a warrior in the Trojan War who is eventually defeated by Achilles. In Polynesia, Cygnus was often recognized as a separate constellation, in Tonga it was called Tuula-lupe, and in the Tuamotus it was called Fanui-tai. Deneb was given a name. The name Deneb comes from the Arabic name dhaneb, meaning tail, from the phrase Dhanab ad-Dajājah, in New Zealand it was called Mara-tea, in the Society Islands it was called Pirae-tea or Taurua-i-te-haapa-raa-manu, and in the Tuamotus it was called Fanui-raro. Beta Cygni was named in New Zealand, it was likely called Whetu-kaupo, Gamma Cygni was called Fanui-runga in the Tuamotus. The three-letter abbreviation for the constellation, as adopted by the IAU in 1922, is Cyg, the official constellation boundaries, as set by Eugène Delporte in 1930, are defined as a polygon of 28 segments. Gemini is one of the constellations of the zodiac. It was one of the 48 constellations described by the 2nd century AD astronomer Ptolemy and its name is Latin for twins, and it is associated with the twins Castor and Pollux in Greek mythology. Gemini lies between Taurus to the west and Cancer to the east, with Auriga and Lynx to the north and Monoceros, the Sun resides in the astrological sign of Gemini from June 20 to July 20 each year. By mid August, Gemini will appear along the horizon in the morning sky prior to sunrise. The best time to observe Gemini at night is overhead during the months of January and February, by April and May, the constellation will be visible soon after sunset in the west. The easiest way to locate the constellation is to find its two brightest stars Castor and Pollux eastward from the familiar “V” shaped asterism of Taurus and the three stars of Orion’s belt. Another way is to draw a line from the Pleiades star cluster located in Taurus. In doing so, you are drawing a line that is relatively close to the ecliptic. The constellation contains 85 stars visible to observation on Earth without a telescope, the brightest star in Gemini is Pollux, and the second brightest is Castor. Castors Bayer designation as Alpha is attributable to a mistake by Johann Bayer, α Gem is a sextuple star system 52 light-years from Earth, which appears as a magnitude 1.6 blue-white star to the unaided eye. Two spectroscopic binaries are visible at magnitudes 1.9 and 3.0 with a period of 470 years. A wide-set red dwarf star is a part of the system, β Gem is an orange-hued giant star of magnitude 1.2,34 light-years from Earth. Pollux has an extrasolar planet revolving around it, as do two other stars in Gemini, HD50554, and HD59686, γ Gem is a blue-white hued star of magnitude 1.9,105 light-years from earth. δ Gem is a binary star 59 light-years from Earth. The primary is a star of magnitude 3.5. The period is over 1000 years, it is divisible in amateur telescopes. ε Gem, a star, includes a primary yellow supergiant of magnitude 3.1,900 light-years from Earth. Johannes Hevelius's depiction of Andromeda, from the 1690 edition of his Uranographia. 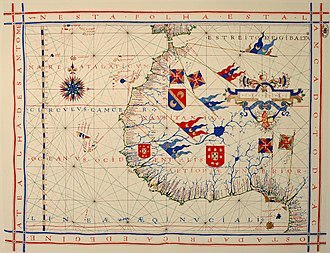 As was conventional for celestial atlases of the time, the constellation is a mirror image of modern maps as it was drawn from a perspective outside the celestial sphere. Photo of the constellation Andromeda, as it appears to the naked eye. Lines have been added for clarity. M31, the Great Galaxy of Andromeda. The constellation Canes Venatici as it can be seen by the naked eye. Sky image centered in Cassiopeia taken from a dark site. Some deep sky objects are visible, including the Andromeda Galaxy. The R Coronae Australis region imaged with the Wide Field Imager at ESO's La Silla Observatory. According to ESO, "The light blue nebulosity seen in this picture is mostly due to the reflection of starlight off small dust particles." "A prominent dark lane crosses the image from the centre to the bottom left. Here the visible light emitted by the stars that are forming inside the cloud is completely absorbed by the dust. These objects could only be detected by observing at longer wavelengths, by using a camera that can detect infrared radiation." The constellation Dorado as it can be seen by the naked eye. NGC 1566 is an intermediate spiral galaxy. LEDA 89996 is a classic example of a spiral galaxy. The constellation Circinus as it can be seen by the naked eye. 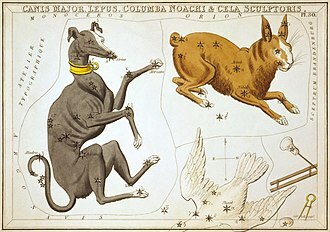 The constellation Canis Minor can be seen alongside Monoceros and the obsolete constellation Atelier Typographique in this 1825 star chart from Urania's Mirror. The constellation Canis Minor as it can be seen by the naked eye. 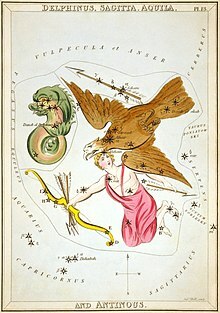 Aquila, with the now-obsolete figure of Antinous, as depicted by Sidney Hall in Urania's Mirror, a set of constellation cards published in London around 1825. At left is Delphinus. NGC 772, with a notated supernova.